Though the indiscriminate violence in Syria and Gaza is becoming indistinguishable, unlike Syria, the west can take relatively simple measures to end the war on Gaza. The world has demonstrated its outrage over Gaza and Syria. But unlike Syria, western governments still have means to stop the violence in Israel-Palestine. Demotix/Brian Duffy. All rights reserved. The current Israeli war on Gaza looks like it will be even more intense than the last two offensives of recent years. The Israeli military is destroying entire neighborhoods in a matter of hours and indiscriminately inflicting terrible civilian casualties. Palestinian civilians are trapped in a tiny strip of land with no place of refuge and the Israeli right-wing is adopting a tone that is increasingly genocidal. However some liberal commentators have made a comparison between events in Gaza and the civil war in Syria to say that Israel is being unfairly criticised in the west. They argue that in comparison to a conflict that has killed at least 150,000 people in Syria, the war on Gaza pales into insignificance, and that the occupation of Palestinian land is a minor issue when compared to the prolonged ferocity of other conflicts around the world. However this argument is based on a false equivalence that can be easily dismissed. Israel is a close ally of the west; Syria is not. Israel is a country that was created as a result of the colonial rule of the UK and later empowered by the US through the annual transfer of billions of dollars of aid. Syria has been at odds with the west for decades, a fraught relationship that has sometimes resulted in the severing of diplomatic ties with the US. Unlike Israel it receives no western aid. In response to the violent handling of the Syrian revolution, an uprising which later mutated into a civil war, western countries imposed further sanctions on Damascus. Syrian ambassadors have now been expelled from the US, Canada, Australia, Japan, Germany, Spain, France, Italy and the UK. Last year, the US, UK and France came close to military intervention in order to remove Syrian President Bashar al-Assad. By contrast, throughout the last three wars on Gaza as well as the attack on Lebanon in 2006, conflicts which have killed more than 4000 Palestinians and Lebanese, Israeli ambassadors have remained in western capitals. No sanctions have been imposed and the US continues to transfer around $8.5 million a day in aid, support which some estimates suggest amounts to a total of $233.7 billion over the last six decades. The total value of British arms sales to Israel is £7.9 billion and in recent years the UK has continued to supply arms to Israel, despite the possibility of their use in attacks on civilians in Gaza. Through these channels, the west retains many levers through which it could pressure Israel to end its violence. The proximity of Israel to western policy makes us responsible for its actions yet none of these levers have been pulled. How quickly would Israel halt its offensives–and its occupation and settlement of Palestinian land–if the US were to threaten to end its aid. The expulsion of Israeli ambassadors or sanctions along the lines of the Boycott, Divestment and Sanctions (BDS) campaign are other means to apply pressure. A boycott could also offer more robust moves if the US and other western countries had to resort to stronger measures, something that may be necessary for Israel, a state that holds the record for ignoring the most UN resolutions. In Syria, it is hard to see what other levers remain for the west, short of direct military intervention or stronger pressure on Iran and Russia, Assad’s main patrons. Military intervention is a high-risk strategy and, given the disasters in Iraq and Afghanistan, US and UK occupations do not guarantee an improvement in the welfare and human rights of civilians. Moreover western coercion of Russia and Iran has so far been ineffective, as the recent crisis in Ukraine indicates. This comparison is not designed to justify western policy in Syria. 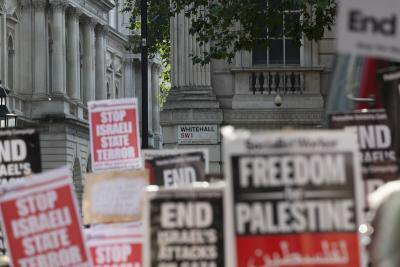 It is meant to rebuff accusations that the 100,000 people who marched in London against the war on Gaza on 26 July are guilty of hypocritically ignoring the Syrian war, or worse, hold some sort of sinister anti-Semitic agenda. Rather, their outrage is justified by the supine stance of the UK government. The Foreign Secretary Philip Hammond is determined to twist the reality of the Israeli offensive into a conflict that features two equal sides, and allocates more blame to Hamas, a group using home-made rockets, than Israel, a state that is firing some of the world’s most technologically advanced weapons at refugee camps in one of the most densely populated areas on the planet. Beyond a few timid criticisms, there has been a total lack of action against Israel by other western states. There are disingenuous claims that even the US is unable to control its client Israel, but this defies common sense and might be a more solid thesis if it were backed by historical examples of US measures to discipline Israel, which don’t exist. Over the last few weeks social media feeds from Syria and Gaza have become almost indistinguishable. Both contain horrifying pictures and videos of civilians killed or maimed by aerial bombardment and both feature expressions of frustration and anger by ordinary people. However unlike the issue of Syria, states in the west can take relatively simple measures to end the war on Gaza. For the sake of people in Gaza we have the responsibility to call on our government to initiate the same measures they have taken against Damascus.